What Will I Learn in an Online Graduate Certificate in Marketing Program? WHAT ARE THE BEST ONLINE GRADUATE CERTIFICATE IN MARKETING PROGRAMS? A graduate certificate in marketing online program teaches students to promote goods and services to potential customers, a skill that is relevant to any business. As media consumption habits shift, companies operate in increasingly complex international settings. Understanding current trends in marketing theory and practice opens opportunities in many marketing-related positions, many of which are growing rapidly. For example, the Bureau of Labor Statistics projects a 19% increase in market research analyst jobs. Marketing professionals play a crucial role as businesses adapt to changes in consumer behavior. Course selections of graduate certificate in marketing online programs vary. Many offer specialized classes leading to particular careers, but all online graduate certificate in marketing programs teach fundamental theories and core skills required for marketing-related professions. The sample curriculum below draws common courses from marketing graduate certificate programs. Advertising and promotion: This course teaches students techniques to promote goods and services. It examines the types of communication channels used in advertising and the advertising potential of new media, such as web-based applications, to prepare students for careers as advertising sales agents. International marketing: In the globalized economy, businesses routinely sell goods and services to customers in other countries. This class presents an overview of the issues and challenges associated with marketing to people with different cultural, political, and economic perspectives. This class is useful for aspiring wholesale and manufacturing sales representatives. Quantitative marketing research methods: This course covers the mathematical principles utilized by market research professionals, including the fundamentals of statistical analysis and regression and modeling techniques. Students learn how statistical analysis can help researchers understand market conditions, consumer behavior, and the effects of pricing on sales. Strategic marketing management: This course teaches students to break down broad marketing goals into actionable plans and advertising campaigns. Coursework presents examples of marketing plans from different business sectors and prepares students to become advertising, promotions, and marketing managers. One of the most prestigious schools in the world, Harvard University offers an online graduate certificate in marketing through its Extension School. Suited for those who have already obtained a bachelor’s degree, this marketing management certificate enables students to build concrete business skills through courses in buyer behavior and leadership best practices, data-driven analysis and marketing communications, and strategic branding. Graduates may also apply successful certificate courses towards a master’s degree in journalism or management at Harvard. The certificate program consists of one mandatory class and three electives, providing students a great deal of ownership over the curriculum. While students can complete their entire certificate online, Harvard offers a number of classes at its Cambridge, Massachusetts campus for anyone who wants a hybrid learning experience. Tuition is fixed at an affordable per-semester price, and online students may access financial aid opportunities, including a number of private scholarships as well as grants for teachers in the Boston area. The University of Central Florida is a leader in distance education, providing online learners with diverse program options and unparalleled support, from writing tutelage to career services. One of the academic tracks available is a graduate certificate in destination marketing and management, a nine-credit, 12-month program which can be completed entirely online. Students have the option to take certain certificate classes at the Orlando campus or one of the other 12 locations throughout the state. UCF’s graduate certificate in marketing online program stands out from its contemporaries for its focus on hospitality management, a lucrative and expanding field in the U.S. and abroad. Through coursework that builds on fundamental marketing and business skills, students learn the ins-and-outs of promoting and facilitating successful travel experiences for groups and individuals. Furthermore, UCF’s program teaches students to analyze the environmental, economic, and socio-cultural effects of tourism in order to boost sustainability and profitability within the industry. Located in a city known for international business, Boston University’s global marketing management online graduate certificate program focuses on successful marketing in the global economy. Through a curriculum that emphasizes internet-based strategies and campaigns, students prepare for positions as advertising agents, sales manager, and market research analysts, all careers projected for continued growth through 2024. This marketing graduate certificate consists of four courses: ecommerce, innovative marketing techniques, and two administrative sciences electives chosen in consultation with a faculty advisor. Distance learners are able to take online courses with students from Latin America, Europe, and the Middle East, enabling them to discuss best practices around the world. For students who are considering graduate degree work, certificate courses also count towards the completion of a master’s in global marketing management, another online program at BU. Per-credit tuition is fixed and affordable, and online students have access to financial assistance, including graduate assistantships. These graduate assistantships grant not only a sizeable stipend, but also the opportunity for professional development and networking. Colorado State University, provides distance learners with several flexible academic opportunities, including a graduate certificate in marketing online. Consisting of nine credits, CSU’s marketing management certificate emphasizes fundamental industry topics like consumer behavior, strategic sale practices, and effective ways to conduct focus groups and analyze data. Though they have up to three years to complete the program, students usually earn their certificate in two semesters. Most CSU graduates obtain gainful employment as promotions managers, green marketers, and postsecondary business teachers. Online tuition is priced at a fixed per-credit rate and financial aid is available, including external and internal scholarships and additional aid for active military and veteran students. For those who want to pursue a graduate degree, certificate courses count toward the completion of CSU’s remote master of business administration. Established in 1998, Pennsylvania State University’s World Campus offers distance learners the same globally recognized and career-focused education it provides traditional students, including identical accreditation upon graduation. Among the academic programs available is an online graduate certificate in marketing analytics that teaches students how to identify and interpret key data in order to enhance a company’s product diversity, consumer base, and market expansion. This specialized focus prepares graduates for careers as sales managers, brand experts, and social media influencers. Students take four courses from a prescribed list or choose classes with the help of an academic advisor. Distance learners are able to earn their certificates in just 12 months. Tuition is priced per credit for part-time students and at a fixed semester price for those taking classes full-time. Certificate students are considered “non-degree” and are therefore not eligible for scholarships. However, Penn State does offer installment plans and third-party loans. Admission requirements include a bachelor’s degree or higher from an accredited US institution and GRE or GMAT scores. Liberty University offers some of the most affordable and highly recognized remote academic opportunities in the country, including a graduate certificate in marketing online program that strengthens students’ leadership and communication skills. The curriculum consists of three mandatory classes in strategic marketing management, promotions, and research. Most students earn their certificates in less than one year, with the option to dual enroll while also pursuing a bachelor’s degree. Some students go on to apply certificate courses towards the completion of an online master’s degree at Liberty, maximizing the efficiency of their college experience. Online tuition is low and priced per credit hour, with full-time students paying less than their part-time counterparts. Liberty provides distance learners with ample support, including online library services and writing help as well as a number of preparatory courses aimed at strengthening reading, writing, and college preparedness skills. Among UCCS’s several business-related tracks is the online graduate certificate in marketing, which consists of one mandatory class and three electives. Coursework begins with an introduction to key marketing strategies. Students then choose the remaining classes based on their interests and goals, including social media innovations, international marketing and exports, or another specialized topic. In order to apply, prospective students must submit academic records, GRE or GMAT scores, a professional resume, and a statement of purpose. Online tuition is priced at a fixed per-credit rate regardless of a student’s residency status. UCCS supports its distance learners through financial assistance and academic services like technical support and online tutoring. Students also have access to the College of Business’s resources, including its Career Development Center and network of alumni and partners. Located in Vermillion, the University of South Dakota has established itself as a leader in distance education, providing ample opportunities for academic and professional advancement. Among the programs offered is an online graduate certificate in marketing that equips students with skills necessary to develop, maintain, and analyze consumer and corporate brands. This includes knowledge of market analytics and strategic operations as well as firm understanding of how technology influences individual and organizational buying behaviors, and therefore promotional campaigns. The curriculum totals 12 credit hours, and includes two mandatory classes in managerial marketing and advanced consumer behavior. Students then pick two more courses from a prescribed list or may choose another approved special topic. USD prices its online tuition at a flat per-credit rate regardless of a student’s residency status. The school also helps distance learners through services like veteran support, online writing tutelage, and disability services. Considered one of the best-value southern universities, Saint Leo offers a large selection of distance learning opportunities, including an online graduate certificate in marketing. Consisting of 21 credit hours, the Saint Leo option stands out among similar programs due to its breadth, making it a great option for business professionals who want to enhance their careers through education, but don’t want to pursue a full master’s degree. The curriculum is predetermined in order to give students a comprehensive marketing education in topics like sales management, global brands, and new product development and innovation. Tuition rates are fixed regardless of where a student resides. Distance learners may apply for financial aid, including institutional scholarships and grants. Students may also lower the price of their certificate program by transferring college work or applying prior learning experiences, such as military training and corporate-sponsored professional development. Southern New Hampshire University offers more than 200 fully online academic programs. Students may also choose a hybrid learning format by taking certain classes at the main Manchester campus or one of the school’s many regional centers in New Hampshire and Maine. Among the options available is an online graduate certificate in marketing that teaches students to design, implement, and analyze the key components of an overall business plan. The certificate prepares students to pursue careers in sales management, market data analytics, and social media brand operations. The curriculum consists of one mandatory class in marketing strategies and four electives, enabling students to build a degree plan that suits them. With five 10-week terms per year, students can learn at their own pace. Tuition is fixed regardless of a student’s residency status. U.S. service members and their spouses are eligible for a considerable discount. A graduate certificate in marketing leads to a variety of careers, including positions as advertising sales agents, wholesale and manufacturing sales representatives, and sales managers. Students who excel at developing strategies may work as advertising, promotions, or marketing managers, and those who enjoy qualitative and quantitative research often pursue careers as market research analysts. These professionals develop publicity for brands and companies. They may work within corporations or for outside agencies hired to execute campaigns. Advertising sales agents sell advertising opportunities to client companies. They usually work for newspapers, television channels, radio stations, or websites. However, some work for multi-channel agencies, selling advertising across mediums. Market research analysts conduct in-depth studies of market conditions and consumer behavior to determine the best way to market and sell products and services. They use statistical analysis to determine prices and effective promotional techniques. Sales managers are responsible for generating revenue through sales of products or services. They lead teams of sales representatives to meet data-driven sales goals. Further, they help marketing managers develop promotional campaigns to maximize sales. This specialized sales role involves providing large volumes of goods and materials to businesses and government agencies. Wholesale and manufacturing sales representatives must understand product lines and client-need cycles. Accreditation is the process by which an outside agency validates the quality of an educational institution. Historically, academic programs were accredited by regional agencies, and career preparatory programs were accredited by national agencies. While regional accreditation is still preferred for universities, online education makes national accreditation more appropriate for some schools. Accreditation can affect a student's ability to transfer credits and secure financial aid. 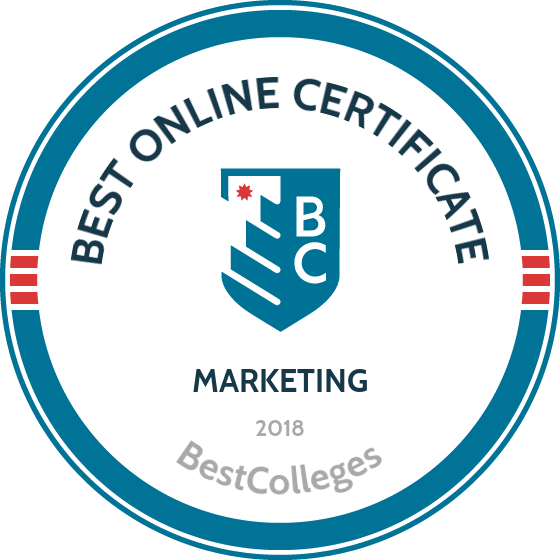 Although certificate programs are not always vetted in the same way as degree-awarding programs, online graduate certificate in marketing programs offered by accredited colleges are typically more highly respected by educational institutions and employers. The Department of Education maintains a database of accredited postsecondary institutions. An online graduate certificate in marketing is a cost-effective way to launch a marketing career. However, securing financial aid for certificate programs may be complicated because federal financial aid is intended to finance degree programs. Although not all certificate programs qualify, students enrolling in a graduate certificate in marketing online program should complete the Free Application for Federal Student Aid, or FAFSA, to explore federal financial aid options. Private student loans are available, and some employers offer tuition reimbursement.